US crude oil inventories: Numbers from the American Petroleum Institute surprised the market yesterday, with US crude oil inventories declining by 2.13MMbbls over the last week, compared to expectations of a stock build. The API also reported that gasoline inventories declined by 3.42MMbbls, whilst middle distillate fuel oil stocks fell by 246Mbbls. The Energy Information Administration is scheduled to release its weekly report later today, and expectations are for a crude oil build of somewhere around 2.5MMbbls, according to a Bloomberg survey. Saudi-Kuwait neutral zone: According to Platts, discussions between Saudi Arabia and Kuwait to restart production at two oilfields in the neutral zone have broken down, with sovereignty reportedly an issue. The Khafji and Wafra oilfields could have added as much as 500Mbbls/d of production, and some in the market had been expecting to see a restart of production in the neutral zone to help offset further potential losses from Iran as a result of US sanctions. Iron ore production: Production updates from miners have largely been positive so far, with both Vale and BHP reporting robust growth in iron ore production. Vale and BHP saw output rising 10% year-on-year and 8% YoY to 105mt and 69mt respectively in 3Q18. Meanwhile, Rio Tinto reported a 5% YoY fall in shipments, with shipments totalling 82mt due to planned maintenance and safety pauses. Combined supplies from all three miners were up 6% YoY to 256mt in 3Q18. The last of the big four, Fortescue is scheduled to release its latest production update on the 25 October. Meanwhile, turning to demand, the World Steel Association has said that global steel demand growth may slow from 3.9% in 2018 to 1.4% in 2019 as trade tensions hurt Chinese consumption. Sugar set for a downward correction? 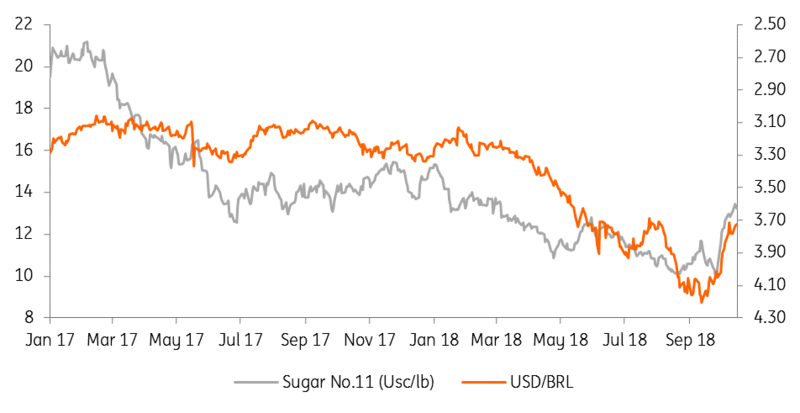 The No.11 sugar market has rallied over 20% since the start of October, driven by a recovery in the Brazilian real and crop downgrades in both CS Brazil and the EU. However, as we wrote in a report earlier this week, we do expect the pressure of Indian sugar exports to weigh on the market in the near term. That said, we do become more constructive towards the sugar market when we move into the 2019/20 season, with the global balance expected to tighten. Copper: What’s it going to take to flip the curve?